The winners of the 2016 Ledger Awards for excellence in Australian comics and graphic novels have been announced. 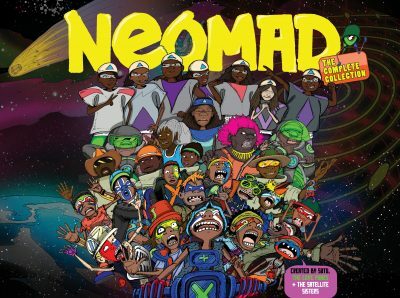 The winner of the 2016 Gold Ledger is Neomad: The Complete Collection (Sutu, The Love Punks & Satellite Sisters, Gestalt), a ‘neon-infused, sci-fi punk adventure series set in Australia’s Pilbara region in the year 2076’. The comic is a collaboration between graphic artist Sutu, who had eight titles shortlisted for the 2016 Ledgers, and more than 40 young people in the Ieramugadu community in Roebourne, Western Australia. It also exists as a multimedia app. The winners of the Silver Ledger are: Anders and the Comet (Gregory Mackay, A&U); Black Magick: #1-3 (Greg Rucka & Nicola Scott, Image Comics); The Diemenois (J W Clennett, Hunter Publishers); Fly the Colour Fantastica (ed by Vikki Ong & Eri Kashima, Veriko Operative); and Oglaf (Trudy Cooper & Doug Bayne, Topatoco US). Bernard Caleo was awarded the 2016 Platinum Ledger for contribution to Australian comic arts and community, and Peter Chapman and Syd Nicholls were the inaugural recipients of the Ledger of Honour Hall of Fame award. The awards are named after Australian comic artist Peter Ledger. Gold Ledgers are awarded to projects that appear on five or more judges’ final shortlists, Silver Ledgers to titles appearing on four shortlists and Bronze Ledgers to titles that appear on three. For more information, visit the Ledger Awards website here.